Welcome to the ShoeSchool Shoe Last Library. A well-rounded collection of Shoe Lasts is the all important secret to being a successful Shoe Designer or Craftsman. 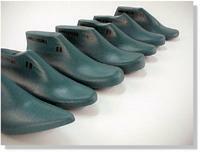 The shoe last is not only your canvas, it is the mold that will give your shoe creations form and function. Developing a Complete Library Collection can take years of trial and error. We have assembled a "core" of the most Basic & Classic types of shoe lasts for our students, to help them get started building their own library. We do not sell shoe or boot lasts to the general public. Shoe Lasts are known to be quite ancient in their origin. Traditionally they were made of Hardwoods, such as Maple or Beech, and were carved by the village Last Maker or the Shoemaker. Right & Left shoe lasts were introduced in the mid 1800's. Before that time, shoe lasts were made in a symmetrical shape, and the shoe would mold to the right or left foot as it was worn and became "Broken In".